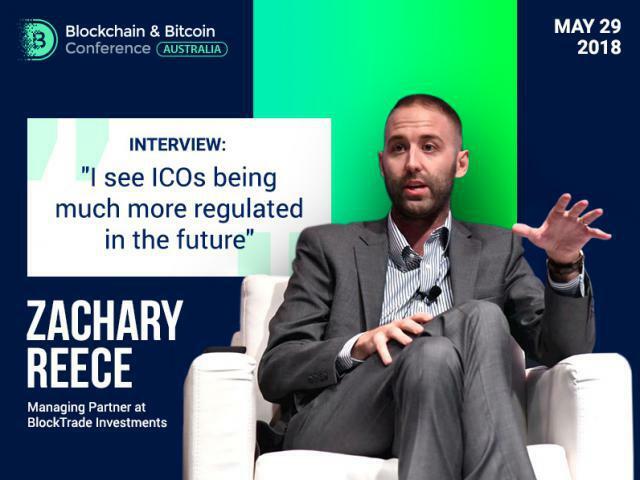 ICOs will be more regulated in the future, and a real marketplace will see a responsible climate versus the greed and a money grabbing, believes Zachary Reece, Managing Partner at BlockTrade Investments. Zachary Reece is the expert in financial and tech industries. In the framework of the Blockchain & Bitcoin Conference Australia on May 29, he will participate in and moderate the panel discussion “ICOs: Opportunity or Threat?”, talking about ICO’s impacts on economy and its regulations. In the interview, Zachary Reece explained the need for ICO regulation and provided tips on how to recognize profitable investment deals. BCA: As you are going to participate in the discussion on whether ICOs provide opportunities or threats, we would like to ask you first about the ICO regulation. Do you think that it is needed and why? Z. R.: I’m absolutely in favor of regulation. ICOs at the beginning have been very official. They allowed us to disrupt the system and ultimately fundraised projects, so that they were economically and socially viable. Unfortunately, they’ve become a breeding ground for individuals who really have priorities of greed and monetary gain, rather than being official and making sure that the liquidity in this community really stays available. And I guess, from my standpoint, we can develop new projects and continue to develop our community. So, they potentially run a risk at this point of starting our growth. And as you can see, with the liquidity that has been observed by many projects that have 50 million dollar hard caps, you start to see the fact that there is only a limited amount in our market cap. So, these projects start to absorb that source or that amount of funding. You start to see a lot of individuals being involved in the community, and you start to see a lack of interest from new individuals, because the community is not striving the ways that it is used to. BCA: Do you have any recommendations on how to differentiate illegal scam from the profitable investment deals? Z. R.: There are a few really clear options that you have, when you’re taking a look at whether it’s a viable investment opportunity or it is simply a money grab. The things we are looking first of all (and you’ll hear that from every experienced investor in this industry) is that you have to look at the team. Ultimately not from their major cooperation, or that they managed Google or something of that nature. You need to focus on who they are and how they help their blockchain development, how they help our community to evolve, and how long they have been involved in impact in social and economic justice in our community. And when you see the strength, that is the first indicator that the project has really established itself on a level footing. Only then, you have to look at the white paper. And I feel like everyone is willing to ask for it. But no one wants to read it and understand it. If there is lying it says, individuals can walk away from the project at any point of time. I don’t care what the reason is. Don’t invest in it. That is clearly a scam, that is clearly a scheme so that in the end of the day they have the ability to keep your money, whether they are successful, or they develop the experience you enjoy. It is important that you make sure that you have a goal on this marketplace and that you really understand where you’re investing in: who are the individuals in that aspect or sector of the community that have actively changed in the past, because those are most likely the individuals that are going to spearhead the future projects that are going to be successful. BCA: How would you define the risks in participating in an ICO? Z. R.: It all depends ultimately. If you’re participating in ICOs with a managed product or with a potentially private equity fund, I think the risk can be very miniscule, because there is high diversification and very low concentration of your investment. For those individuals, who try to, as we say in America, swing through the fence or to try to hit the home run on the first swing by putting all of their funding and all of their capital in one project, I think you start to see the risk level raise significantly and exponentially in some cases. BCA: In your opinion, what should ICO launchers and investors do to bring ICO to the next level? Z. R.: In my opinion, we should start to self-regulate. We should have a regulatory body like the SCC in the United States that is ultimately oversees operations, oversees the aspects of projects and doesn’t approve or condemn, but rather starts to regulate what is realistic, what is responsible and ultimately what has been official for ultimate growth and prosperity of this community. I think what we have to take a step back from is this unorchestrated decentralization and utopian viewpoint of wanting to change the system overnight. Because ultimately, over the last 200-300 years the system has survived for a reason. They’ve built and developed an infrastructure to be able to sustain changes in the economy. And as we see from December to now, we don’t have the same regulation and ultimately the same control that all these organizations yield over this time. BCA: The panel discussion is going to explore impacts of ICO on the economy, so could you tell us if these impacts are more positive or negative in general, please? Z. R.: Well, if we talk about 2017, I would say they are more negative. If you take a look, 80$ of our ICOs didn’t even make it to the market. And that’s may be nice, cause the real number is 92% that didn’t ultimately make it to the marketplace. 12% for legal reasons or for banking reasons. And only 8% made success. Let’s think for a second. 8% of our entire community was successful in what they wanted to achieve. They promised the investors for the money they took. 92% of them were essentially wasted. And what did we learn from that? We became more socially conscious, economically conscious of the impact of simply trying to require money without any substance. And what I think we’re seeing now in the first part of this year with the market correction with the experience is a new and rejuvenated community that understands the reason for regulation: not to put handcuffs on people, but ultimately to say, listen, this is best for the community, this is best for the global economy moving forward, and it is time we take noticed to move responsibly forward. Now in 2018, I don’t want to project that everything was negative in 2017: we’ve seen such individuals as Nimrod May from Sirin Labs, individuals like Mikhail Mironov from ICORating, who are having one of the most successful ICOs of 2017, and now is coming out with one of the first cell phones that has an encrypted wallet included on an Android platform, which I think a phenomenal piece of technology moving forward. You see ICORating company starting to come into the picture telling that these individuals are stunting the growth of the economy or you not going to benefit from trying to raise that type of capital. And I think this ultimately serves for a more responsible community and more responsible infrastructure moving forward for the blockchain space. BCA: What do you think about the future of ICO? In what direction will it go? Z. R.: Well, I see very bright future for ICOs. Ultimately, I see them being much more regulated in the future. I see it as a positive, as we get more regulation and we get more individuals in the community that are more from the economic and infrastructure side of things. We are going to see a real marketplace to develop into a responsible and more economically and socially conscious climate versus the greed and simply a money grabbing that we saw at the end of the last year. Meet the speaker and learn more about ICOs at the conference!